John is originally from Aurora, IL. He is currently both an Entrepreneur and Active Duty Aviation Officer in the United States Army. Currently assigned to the Attack Helicopter Battalion in the 82nd Combat Aviation Brigade in Fort Bragg, NC. He graduated from the United States Military Academy in 2014 and finished U.S. Army Flight School XXI in mid-2016. 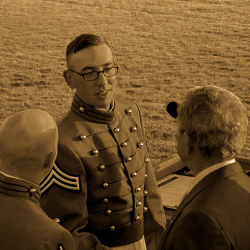 John attended West Point from 2010-2014, where he graduated with a degree in Environmental Geography with honors. He played offensive guard for the Army Team. John has been trusted to command over 20 Officers, Noncommissioned Officers, and Enlisted Personnel as well as manage a property book valued over $40,000,000 including four AH-64D Helicopters in Fort Bragg, NC. He is responsible for supporting the Ground Force Commander in Decisive Attack Operations. John’s experience on the football field, in the weight room, working with coaches, and passion for enhancing physical performance have contributed to him joining AthleteEquip. His extensive sports experience and time spent in the weight room give him the ability to address any coach’s questions or needs. Throughout his life, he has been a part of many programs from Pee Wee to Division 1. Most importantly, he loves being able to help coaches and athletes succeed. He is a Christ-follower, a Husband, a Soldier, and a Friend. Him and his wife, Kacie, have been married since 2014. His personal interests include aviation, lifting, rock climbing, and hiking.